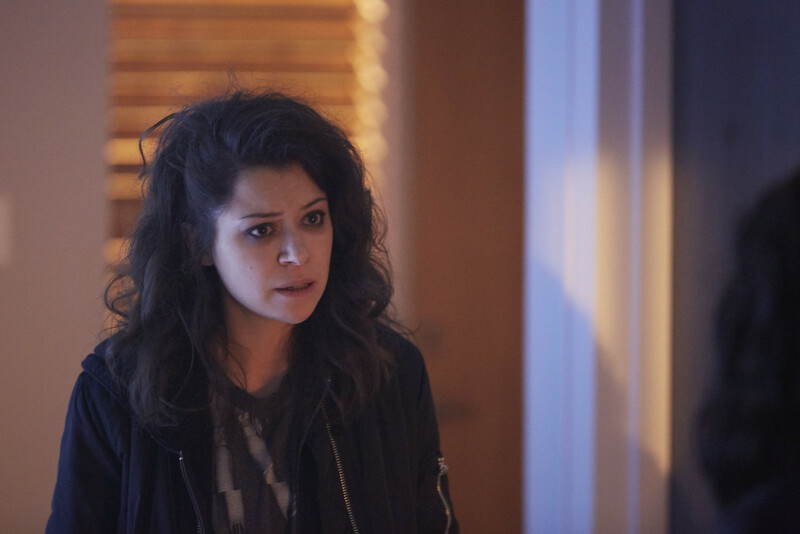 I am always amazed of how Tatiana Maslany can play so many characters on one episode and sometimes in the same scene. In this week’s episode, Maslany was playing six clones but luckily some didn’t have a meaty story line like the others. We see Helena doing some baby scrap booking when Donnie comes to talk to her about his and Alison’s fertility issues. Helena realizes that perhaps Alison is a bit jealous of Helena who is able to get pregnant. We see Helena burying the container that held her eggs. Because Helena didn’t keep it frozen with liquid nitrogen, her remaining eggs died. So Helena gives a proper burial to the container in Alison and Donnie’s flower bed and then grabs her backpack and leaves the Hendrix’s. Rachel is discussing Charlotte’s condition with Ira. Charlotte is the youngest clone to see develop the disease that killed Jennifer Fitzsimmons and what Cosima now has. Rachel wants to do some immunosuppressant therapy as Charlotte is young enough and it might just work. Ira says he will discuss this with Susan Duncan. When Susan comes back, Rachel tells Susan that it is best not to treat Charlotte as they can gather valuable research information from her. Susan tells Rachel that she is going away for a while and shows her her note that she gave to Charlotte. Susan tells Rachel that she knows she is in contact with Ferdinand. I want to highlight for a moment the actress who plays Susan Duncan, Rosemary Dunsmore If you are a fan of Canadian television and especially the CBC miniseries Anne of Green Gables: The Sequel will recognize that Dunsmore played Katherine Brooke, the stern head mistress of Kingsport Ladies College who starts to open up as she befriends Anne Shirley. I quote Katherine quite often especially the following line “Oh! Anne. The summer has flown by so quickly”. Dunsmore was also on Road to Avonlea playing Aunt Abigail, sister to Janet King. So it really puts a smile on my face to see Dunmore back on television and in such a meaty role. Cosima and Scott received Leakie’s head from Alison. A tumor seems to have developed in Leakie’s cheek and this is where the worm has embedded itself. Cosima and Scott are puzzled to what the worm is until when Scott turns off the light we see the tumor and the worm glow in the dark. Cosima realizes that the worm changes one’s DNA. Alison is accosted at a coffee shop by the Neolutionist that Beth was in contact with. This young lady is no longer pregnant and thinks that Alison is Beth. The woman feels betrayed and doesn’t understand why Beth would go to Lifespring Fertility Clinic and mentions how she was just a carrier. So Alison enlists Donnie and Felix to pose as a gay couple looking to conceive. Once in the clinic, Alison helps Donnie get his sample. Also, Donnie notices a neighbor who was thought to have fertility issues like them visibly pregnant. So Alison “bumps” into Portia in the parking lot to find out how she is pregnant. Portia tells Alison to ask for Dr. Bosch and the Bright Born package. Donnie and Felix get in front of Dr. Bosch and mentions Bright Born. Bosch gives them the package and when the DVD is viewed, we see Evie Cho again the same woman we saw with Leakie in Beth’s flashback story. We open with MK performing proper dental hygiene while building a bomb and also looking into Dyad and topside to find the elusive Ferdinand. Ferdinand is with S. and Sarah and will exchange Rachel’s message about Susan Duncan being alive for their source on who tipped them to flee Iceland. Sarah goes to Dizzy’s to meet MK via Skype to see if she can trace the USB message to where Rachel could be. Sarah wants ansywers to how to get rid of the worm in her cheek and believes Susan Duncan can help. MK gets Sarah to place the USB key in Dizzy’s PC and she will see what she can find and agrees to meet Sarah at Beth’s within the hour. What MK finds is Ferdinand’s real identity and Sarah isn’t pleased that MK is a no show. MK calls and isn’t happy that Sarah aligned herself with Ferdinand and cuts ties with her. Sarah goes back to Dizzy’s hoping he will help and has to reveal that she is a clone to gain his trust and help. The two determine that MK is near a scrap yard near Beth’s. The two drive to MK’s and break into her trailer. Before Sarah can step in, Dizzy stops her before she sets off a pressure plate attached to a bomb. The two step over the bomb and Dizzy breaks into MK’s computer to see that MK has been gathering information on Sarah like her telephone calls. Sarah is looking around MK’s and finds a picture of her and another clone, called Nikki, as well as several news articles about an accident in Helsinki. Meanwhile, S receives a text from Sarah asking to meet Ferdinand at Beth. But Sarah isn’t there but MK via the computer. Ferdinand sits down but he has triggered the bomb that MK assembled at the beginning of the episode. If Ferdinand stands up, then he will blowup. MK arrives at Beth’s and we learn that MK’s real name is Vera. Ferdinand was responsible for killing Nikki and disfiguring MK’s face. MK wants revenge for all the people that Ferdinand wants to kill and starts to pour gasoline over him and the surrounding area. Sarah, alerted by S of MK’s deception, rushes over to Beth’s and tries to talk MK down from torching Ferdinand and tells her what the worm is used for. MK still leaves, not before stealing over $3 million of Ferdinand’s money but doesn’t torch Ferdinand. S arrives and disarms the bomb and Ferdinand is safe. So what is Bright Born? Is it a Neolution front considering Evie Choi’s connection to Leakie? And where is Helena off to? Thanks for the recap, great job. I’m crushed that Helena has left the Hendrix home and anxious to find out where she goes. Excellent review. Thanks. Even though MK swore to never contact Sarah again, she left both Sarah and Ferdinand without them knowing the whereabouts of Rachel so I don’t think their relationship is over quite yet.